Well that's it for now. Next time I'll share our wonderful centers with you! Well I hope that you have an excellent Tuesday! Just saw your adorable blog!! You are such a wonderful teacher and a beautiful soul. These children are so lucky to have you as their role model! So happy to have found you on Twitter and look forward to seeing what you and the kidlets do next!! Thanks for following my TPT store. I am now your newest blog follower. Can't wait to read about your K adventures! I love this post! You make me want to start a DonorsChoose project! Can you tell me what company you used to order these ball chairs. I looked all over the internet and could not find them. Thank you! Jessica, your room is really looking wonderful! 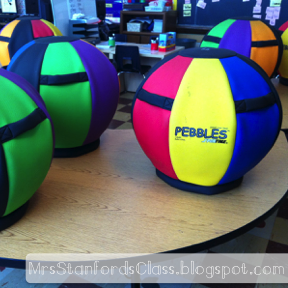 I was wondering what "hiccups" you may have had when introducing the pebbles seating orbs? Have your students been able to calm down and really focus on seatwork (writing, small group instruction, etc.,)? Love the concept, and think it would be a phenomenal approach for extremely hyperactive students--might help them keep the body moving while working? Thank you for the invitation, and for the compliment! Thanks for emailing me Jessica!! 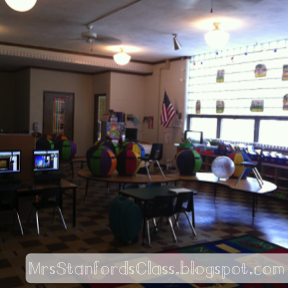 I love your classroom - those seating balls are SO cool!! I'm just starting a donors choose project, so I'm looking forward to getting some great things eventually in my own classroom! Just another note to say how cool those chairs are! I'm super intrigued. I am bummed that they cost so much--it's reasonable of course for something you can use year after year, but wow--to outfit the whole room would cost so much! Thanks for stopping by today and shooting me an email! I also love those chairs! I might have to see if I can find a couple for my small group table. Thank you for sharing the idea! I am so jealous !!!! 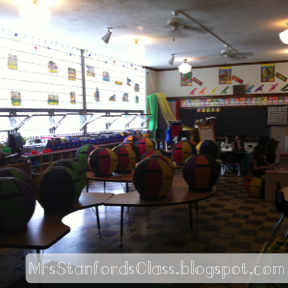 I love those ball chairs! I am going to write a donors choose for those right away. Thanks for the great idea. Thanks for joining in the fun today. I have never seen ball chairs like these. They looks space saving. I love all the natural lighting. Do you know what size of these balls you ordered? It looks like there are 45, 55, and 65cm. Love your ideas! Thanks for sharing. My school site is very interested in ordering some of the Pebbles seats. Can you please share with us where you got them from?